A nice texture pack that's compatible with the wildgrass mod. 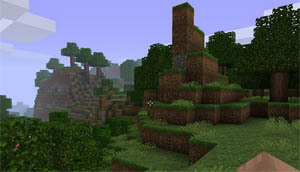 The texture pack makes changes to terrain, particles, armor, art, environment, gui, item and mob. Includes textures such as sheep, skelton, zombie, squid, clouds, chain, diamond, gold, moon, sun and others. Soon to include paintings as well. Based on the original Invertins Tilecraft, SaiyanKirby has taken the gauntlet and is updating the texture pack. Contains textures for armor, art, mob, terrain. Including skelton, sheep, spider, squid and cow. A huge texture pack with some excellent changes to the original Minecraft textures. Eld uses some nice colours and smooth graphics to make this one of our favourites. Includes pumpkin, railtracks, trees, mushrooms, fireplace and lots more. A fun looking texture pack which really pimps the Minecraft look towards a teenage girls fantasy world. Includes some excellent pink planks, pink rail track, blue clay, green cactus, rainbow diamond block. One of the early texture packs released for Minecraft. JohnSmiths is a nice little HD texture pack containing some good modifications, all with a professional finish and good use of colour. Pack contains changes to the environment such as flowers, trees and grass as well as fundamental changes to mobs and armor.